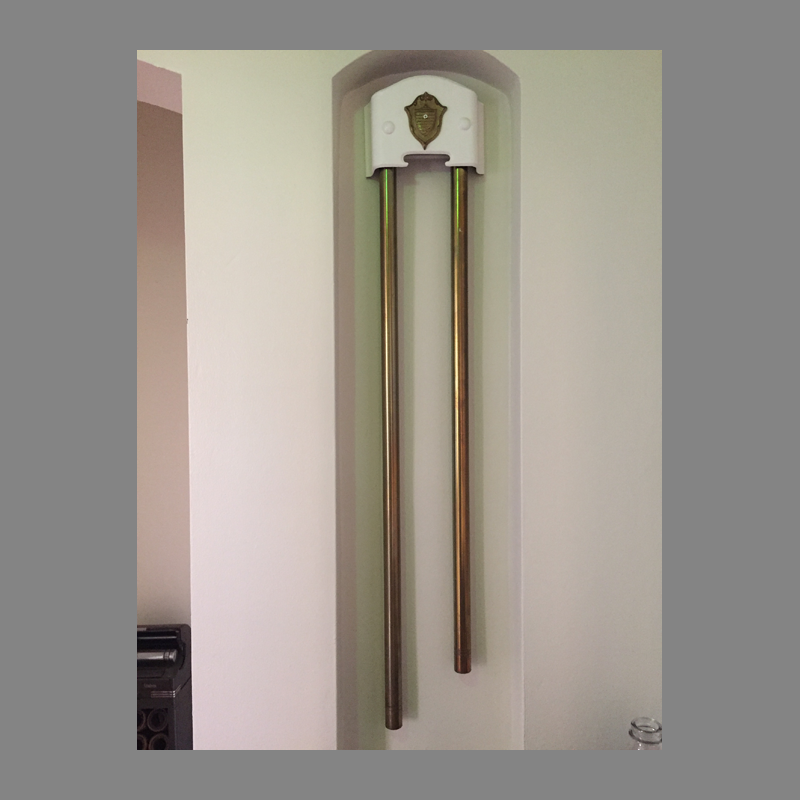 This Tudor Revival style vintage tubular door chime wears a wonderful, and entirely appropriate patina from years of service in a home in the hills above the University of California, Berkeley. You can almost imagine this stately chime hanging on wall next to a stairwell guarded by a full suit of armor. 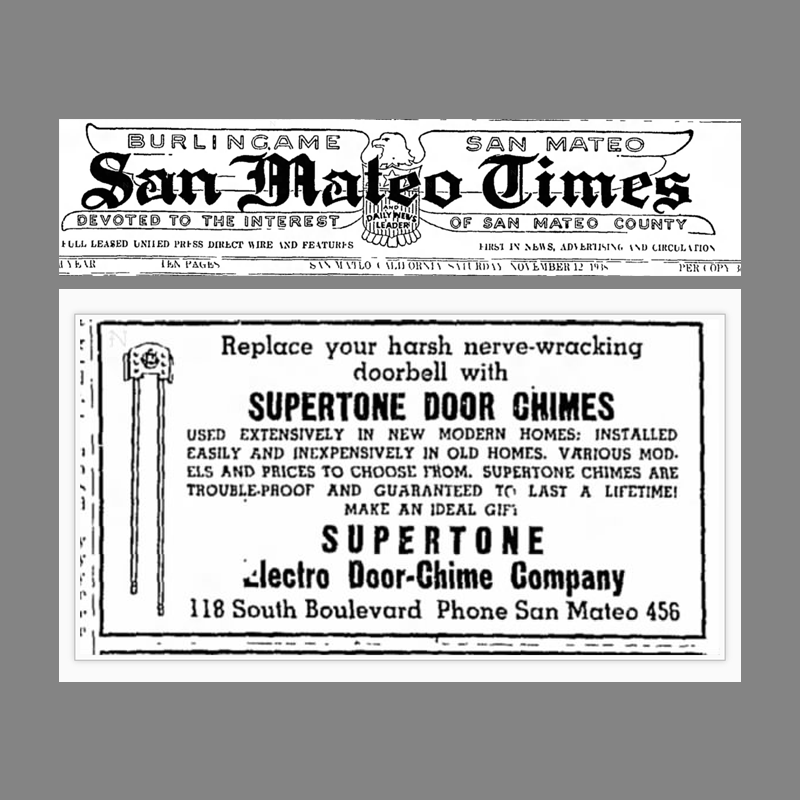 This chime was manufactured by the Electro Door-Chime Company of San Mateo, California and advertised as a “Supertone.” Little is know about this short-lived company save for two advertisements found in the San Mateo Times in late 1938. While the advertisement’s illustration features a different chime cover and ornament, it shows the same tubular bell bottom detail as the Museum’s example. A photograph provided by a reader in San Francisco shows the same rolled-metal cover as the ad with a still different ornament. The reader’s chime mechanism is identical to the Museum example confirming the common Electro Door-Chime Supertone provenance. Electro seems to have found some success providing door chimes for 1930s-1940s Galli-Built homes constructed in San Francisco’s western neighborhoods including West Portal, Golden Gate Heights, Sunset, Parkside and Merced Manor. 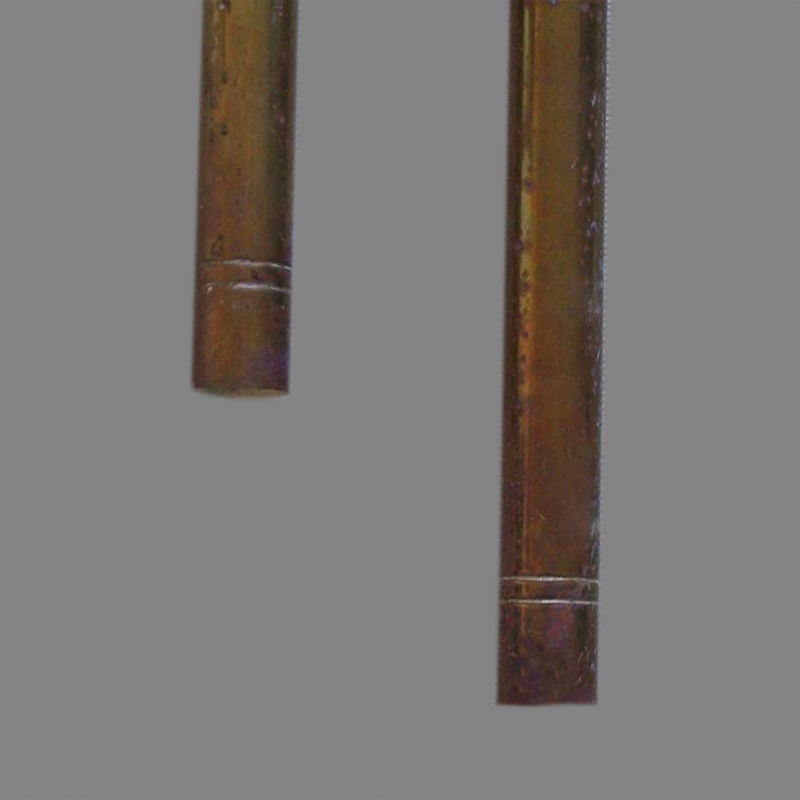 The Supertone is an early long-bell chime as evidenced by the use of of wood in its construction. 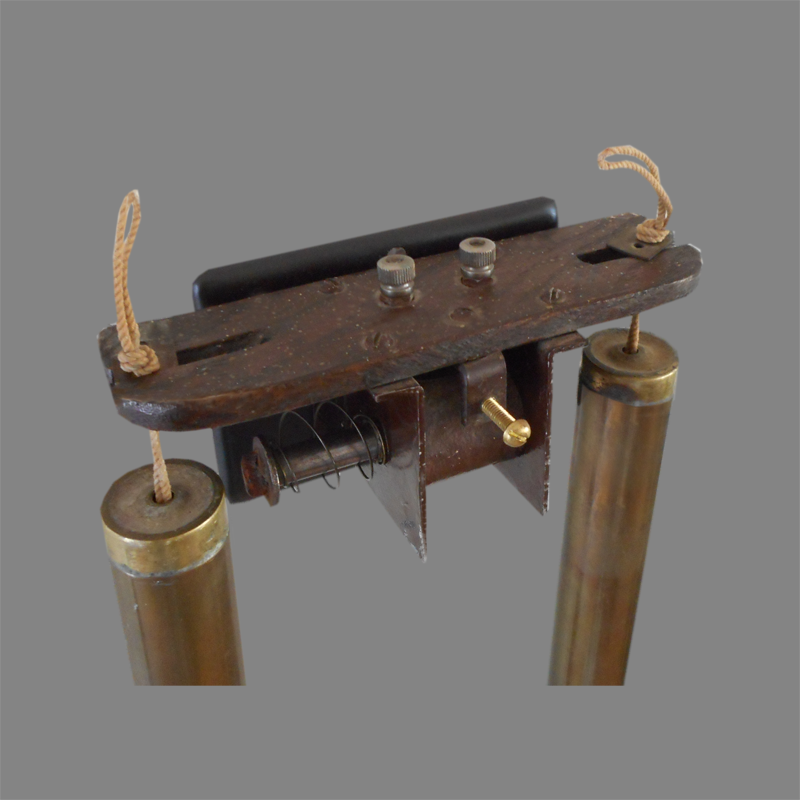 Electro employed a unique “gravity” suspension where the chime’s are adjusted to the correct distance from the strikers by moving the suspension loops in wooden slots. The weight of the tubes then holds the adjustments in place. 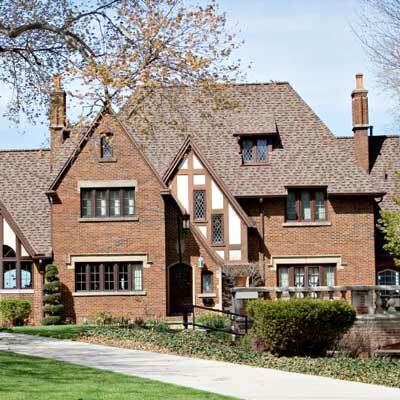 The heavy cast brass medallion on the rolled sheet metal case is typical of quality Tudor Revival home furnishings. The two parallel rings surrounimg the bottom of each bell are a particularly nice touch and apparently a hallmark of Supertone. Please see the DeValera Long Bell Chime for another example of bell ornamentation. 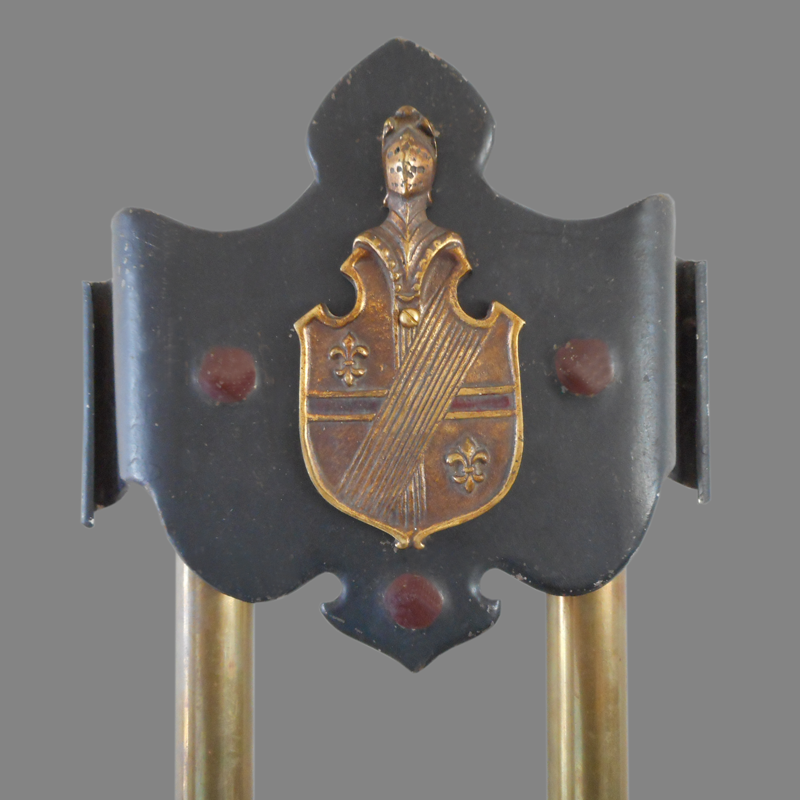 If anybody has any additional information on this, or a similar chime from the Electro Door-Chime Company, please contact the Doorbell Museum.